Low Carb Sandwich Recipes | Top 3! I could eat a sandwich everyday for the rest of my life, and being on a keto diet shouldn't change that. 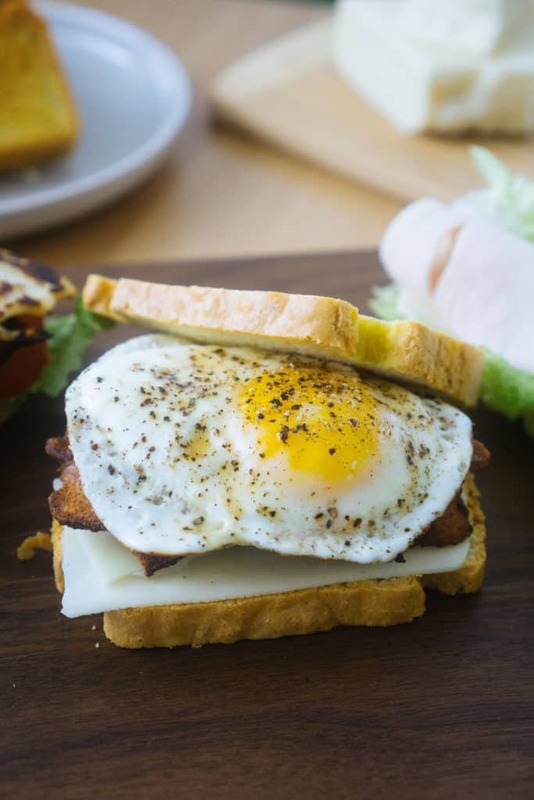 You can now use these super easy, quick to make Low Carb Sandwich recipes to satisfy your sandwich cravings, as well as have delicious work lunches everyday! We've Got Three Perfect Keto Lunches! ​And, all three are perfect for packing in your kids' lunch boxes, to take to work or make for the entire family on busy weekends! Since we have three totally different low carb sandwiches there is no need to worry about someone feeling unsatisfied. Which one is your favorite? Uses the Best Keto Bread recipe. It uses the most filling ingredients: egg, meat and cheese. Guaranteed to be loved by all, keto or not! Uses thick slices of halloumi for the "bread". This is the perfect sandwich for cheese lovers! Refreshing and light - great for picnics or quick, filling lunches for the family. The easiest sandwich to make for busy days - no cooking required. You can use whatever ingredients you have at home to fill the lettuce wraps. A simple, light lunch when you know you'll be having a big dinner! We All Need Perfect Lunch Recipes For Work! If I can be honest, lunch is what always got me through the first half of the day. I used to get in at 6am with my fatty coffee, and slug through work fantasizing about my lunch 80%of the time. Sure, I wasn't a great employee, but I was a great lunch packer hehe. I ALWAYS made sure lunch wasn't something boring because who want's to look forward to a boring, sad lunch? These sandwiches were definitely in the rotation for exciting, delicious, filling lunches! ​Macro Cakes with a side of butter, and syrup! Keto Chili with heaping side of cheese and sour cream to melt on top! Egg Salad with veggies or pork rinds for dipping! ​..are the perfect replacement to all the sandwiches you used to eat before transitioning to low carb! 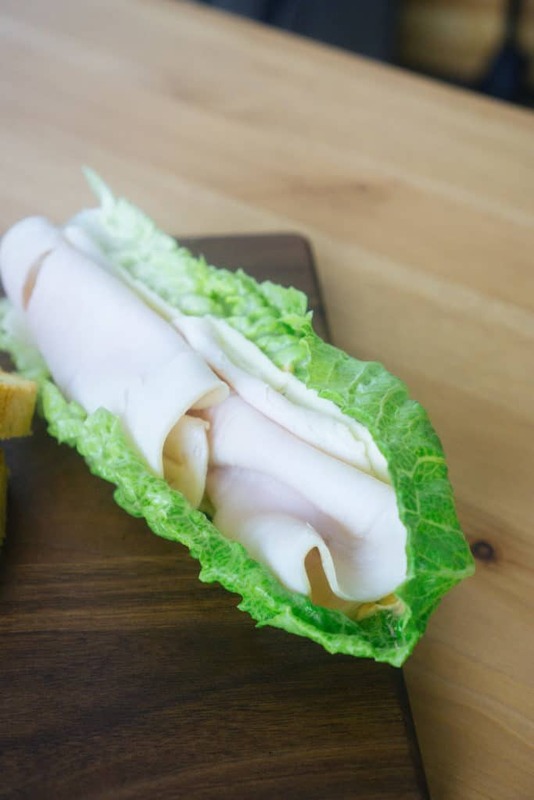 I used to eat a the same exact sandwich everyday for lunch - sourdough bread with turkey deli meat, hummus spread, lettuce, onion and cheese, and I looked forward to it more than anything. Needless to say, sandwiches were my absolute favorite food and never let me down. 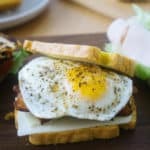 So, after becoming low carb I begin to find myself craving sandwiches more and more, which is where these low carb sandwich recipes come into play! 1. 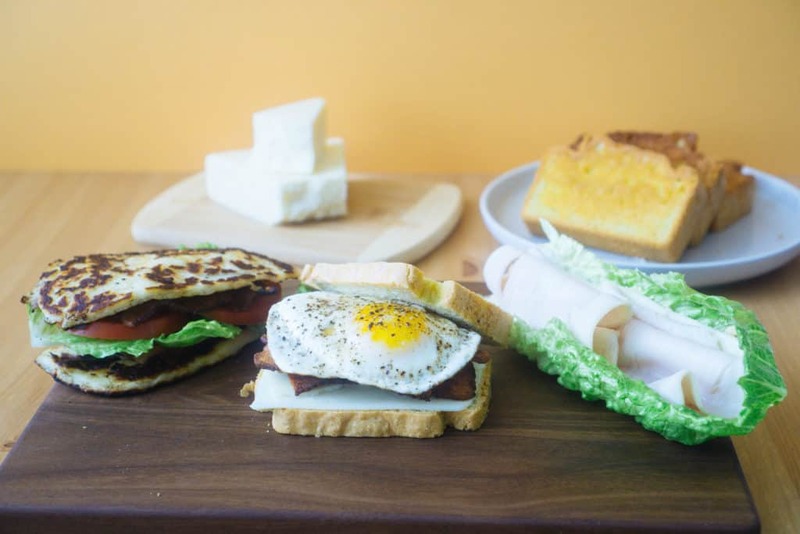 "KetoConnect - Keto Bread Breakfast Sandwich"
2. 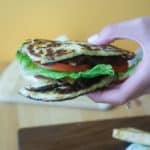 "KetoConnect - Halloumi BLT"
3. 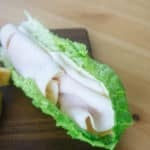 "KetoConnect - Turkey Lettuce Wraps"
Heat a skillet to medium high heat and add in two slice of bacon. Cook and set aside on a plate to cool. Turn the heat to low and crack and egg into the same skillet. Cook to desired done-ness (we like over easy). Set aside on the plate with the bacon. Lay two slice of keto bread down onto a plate. If desired, toast them in the same bacon skillet. Lay down a slice of cheese on the bottom piece. Top with the bacon and then the egg. Optionally, butter the bread or use desired spread, such as mayonnaise, mustard, sugar free ketchup, and top the egg with the second slice of bread. Enjoy! Note: sandwich add-ons will change the nutrition. Heat a small skillet to medium-high heat and add two slices of bacon to the pan. Cook until done and set aside. Turn the heat down to medium and put the two slices of halloumi into the bacon skillet. After a minute or two, the halloumi will naturally release and you can flip it. Cook on the other side until browned and crisp. Turn off heat and set aside. Slice up the tomato and and the lettuce. 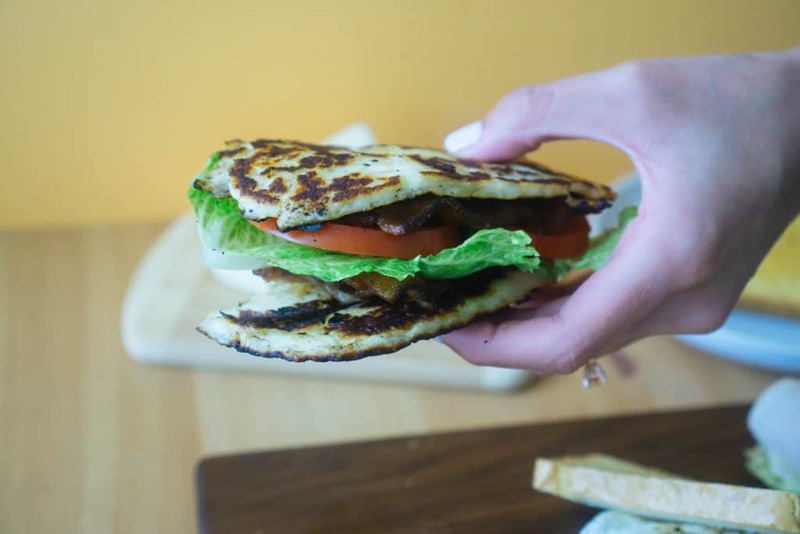 Layer the bacon onto one slice of halloumi, then the lettuce and tomato and place the second halloumi slice on top. Enjoy! Note: if any add-ons are made, such as spreads or more bacon, nutrition will vary! Make Two Wraps: Spread the mayo onto each lettuce wrap and then layer with a slice of cheese. Layer on desired deli meat, we used Applegate Oven Roasted Turkey.